Mass Transit - No More Airports? MASS TRANSIT – NO MORE AIRPORTS? The increase in populations in major cities worldwide is leading to the creation of mega-cities and urban centers which easily exceed 15 million people. This phenomenal growth in urban populations is straining the resources and infrastructure of cities which were designed for half that density, and this presents a major challenge for urban planners throughout the world. Efficient transportation systems are a necessary component for economic, cultural and social development in every community. These systems can include all possible types of vehicles that operate on land, sea and air. The geographic location of the urban center will determine the best combination of systems to service the transportation needs of the city. However, the automobile has become the vehicle of choice throughout the world. We can debate and analyze the reasons for this trend but the automobile will continue to dominate the market as the transportation system of choice for the future. FuturePort is one solution to the problems of traffic congestion in all major cities. Reduction in the volume of traffic on the roads and highways can help to alleviate traffic jams and environmental pollution. This must be accomplished without creating additional difficulties for commuters; otherwise people will not use alternative modes of transport. 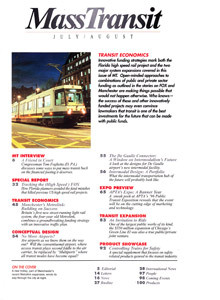 FuturePort is a terminal, located at the junction of multiple transportation systems. These can include personal vehicles, buses, shuttles, monorails, underground subways, commuter trains, high-speed rail and VTOL (Vertical Take-off and Landing) aircraft. Access to rivers and canals could include water-taxis and high-speed hydrofoils. Home » Media » Mass Transit – No More Airports?